A landmark moment has been celebrated in York as it has become the first UK city outside London to trial a new fully electric double decker bus. Representatives from City of York Council, First York and local bus manufacturer, Optare welcomed the arrival of the first “Metrodecker EV” in York today, which will be trialled on the York Park & Ride network and selected city routes over the next month. The zero-emission and fully electric bus has the capacity to carry 99 passengers and has a range of nearly 150 miles from one overnight charge. The new vehicle is being trialled in York following the recent announcement that improvements will be made to the city’s already successful Park & Ride scheme. 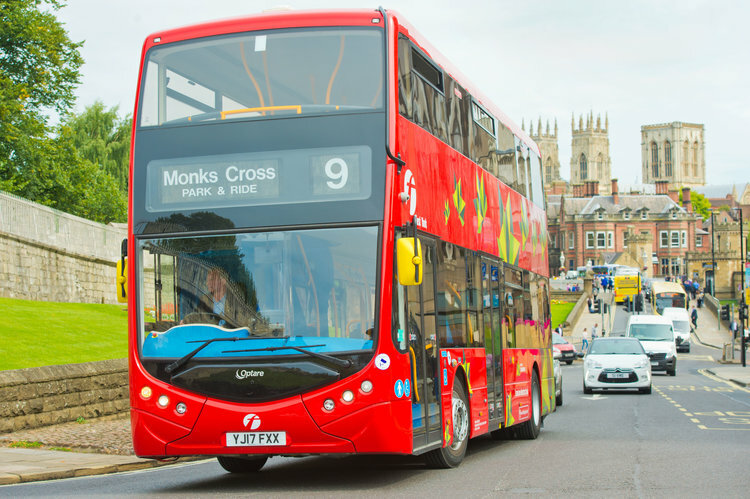 It was promised that new ‘greener’ buses would be introduced to improve fuel emissions citywide, placing York’s Park & Ride as one of the most sustainable and efficient in the country. Speaking about the trial, Councillor Ian Gillies, executive member for transport at City of York Council, said: “I’m delighted to welcome this new addition to York’s green public transport fleet. There will be at least three electric double-deckers among the 14 electric buses on our Park & Ride routes. Marc Bichtemann, Managing Director at First York, adds: “This is another milestone to celebrate in what is already a thriving Park & Ride scheme in York. As one of the UK’s major bus operators, we understand the vital role we play in helping to solve the air quality challenge facing the country and I’m thrilled to welcome the trial of the future of bus travel to York today.